There are so many Philips LCD TVs out there, that it's sometimes hard to see where the differences between them lie. Nevertheless, we've got a pretty sound handle on the 32PF5521D's raison d'être. Basically, it's all about the price. At £900, this TV is shorn of step-up Philips features like Pixel Plus processing and Ambilight, but, performance is our top priority. Connectivity gets off to a corking start by providing two HDMI sockets - a really welcome surprise. Plus, you get most of the other necessities, along with a digital audio output and a Common Interface slot, indicating that despite its price, the 32PF5521D sports a digital tuner. Excellent. The only glitch is that there's no dedicated D-Sub PC input, leaving one of the precious HDMIs as your only choice for PC connection. The digital tuner we mentioned is supported by the now inevitable seven-day Electronic Programme Guide - though we have to say the navigation system for this EPG is far from the most intuitive we've seen. Even without Pixel Plus the 32PF5521D's HD pictures are incredibly sharp, which is a pleasant surprise. Every tiny reflection and texture in the robots' white bodies is revealed with complete aplomb. Even more surprisingly, standard definition pictures look pretty focused too. And this general sharpness is impressively unaccompanied by dot crawl, grain, or other artefacts sometimes seen with some versions of Pixel Plus. The 32PF5521D also serves up deep and authentic toned black levels, helping dark scenes such as the demolition of Professor Lanning's home seem larger in scale and generally less straining to watch. Colours, meanwhile, look enjoyably natural for the most part, and as a final big plus, motion is handled with little of LCD's customary smearing. In an ideal world, dark parts of the picture would contain more subtle greyscale gradation, and darker colours wouldn't be affected by a sporadic green tinge, but otherwise we're happy. Audio is respectable too. The soundstage spreads far and wide without losing cohesion, there's a passable attempt at injecting bass into action sequences, voices are always clear, and trebles only become harsh under extreme circumstances. If we're honest, we approached the 32PF5521D with serious reservations. 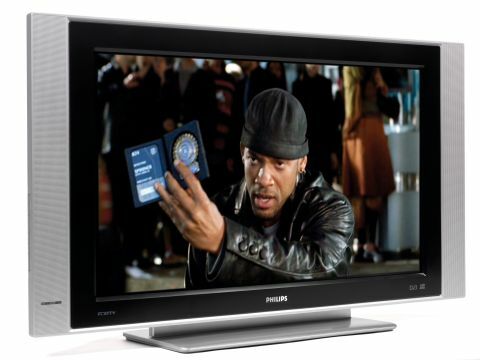 But this LCD TV's great performance with pictures and sonics has convinced us that Philips really can deliver the budget LCD TV goods after all.